“Free water” may sound like what happens when you drink too much water. It is actually “fluid unconstrained by brain tissue, likely because of disease-related degeneration” that turns out to be a biomarker than can be used to track Parkinson’s disease progression in a non-invasive way, thanks to a discovery by researchers at the University of Florida. The hunt for a Parkinson’s disease biomarker of any kind has been going on for years but interest has been increasing over the last decade. A biomarker that can detect Parkinson’s disease, or can track the progression of the disease, or can do both is necessary for measuring outcomes during any clinical trial that tests a treatment that might slow disease progression or cure the disease. 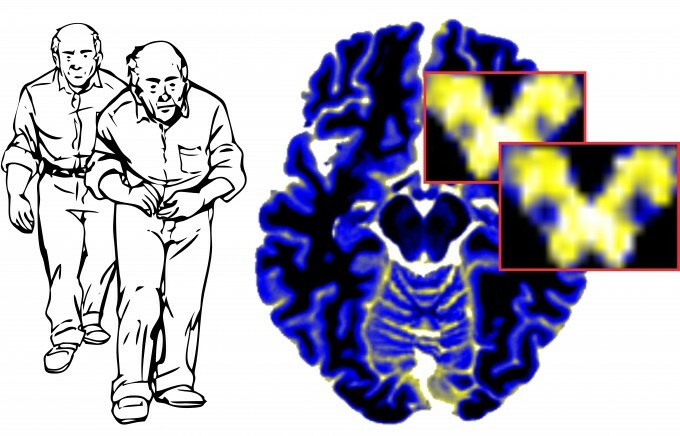 In an article published in the journal Brain, the team of UF researchers used diffusion imaging to look at the amount of free water in Parkinson’s patients’ substantia nigra (a region in the brain associated with Parkinson’s). It was compared to a control group and Parkinson’s patients did have more free water in their substantia nigra than the control subjects. The patients also came back for a second diffusion image after approximately one year and an increase in free water was noted from the initial scan. Left: A Parkinson’s patient’s disease progression over time can increase tremors, rigidty, postural instability, and bradykinesia. Right: Cut outs over the brain image show an increase in free water in substantia nigra in a Parkinson’s subject between the initial diffusion image (left cutout) and the follow-up scan 1 year later (right cutout). The increase in free water predicts the subsequent worsening of bradykinesia over the next year.